Our restless Earth is always changing. Tectonic plates drift, the crust quakes, and volcanoes erupt. Air pressure falls, storms form, and precipitation results. Learn how these powerful forces shape our air, land, water, and weather—and constantly transform our planet. Explore how our response to Earth's changes will impact our future on Earth and discover how your choices impact our future Earth. 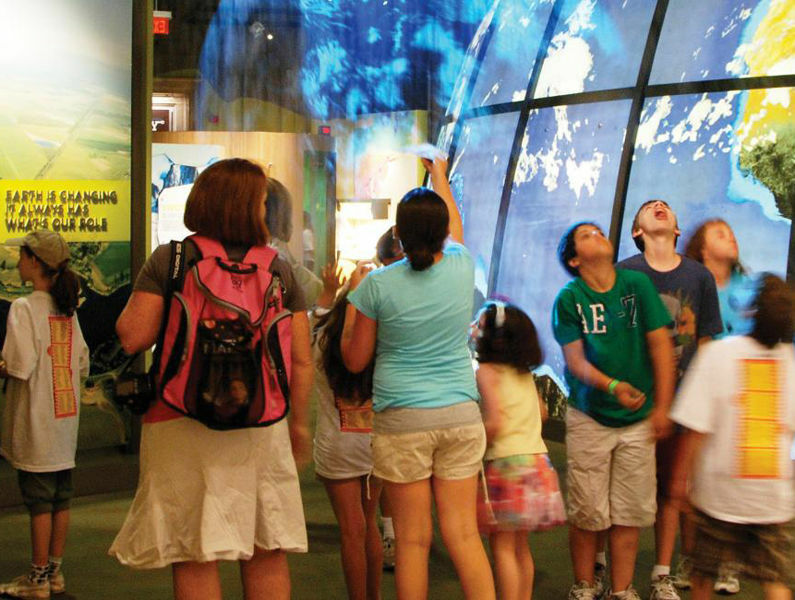 Dynamic sensory experiences demonstrate the interconnected systems of earth science. Calculate your carbon footprint, find solutions to reduce carbon emissions, explore seismographs of recent earthquakes, and construct a building to see if it can withstand an earthquake. Experiment and discover how dams and water volume affect river flow and erosion. Go "on camera" and deliver your own weather forecast. Each experience in Changing Earth provides insights into repercussions that may result from our responses to changes—natural or manmade. and investors in the Inspire Science campaign located in The Joy and George Rathmann Hall of Science.